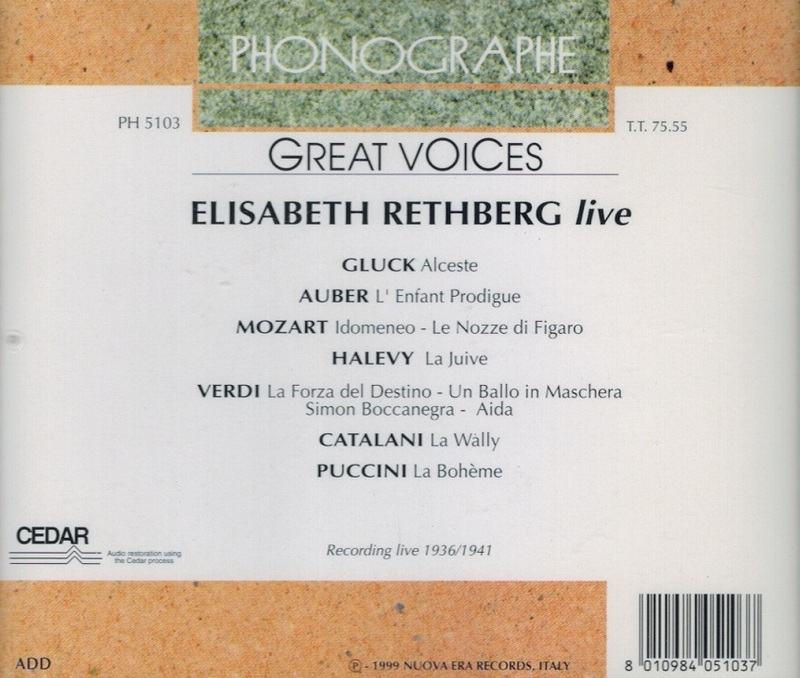 “During the years between the world wars, Elisabeth Rethberg achieved international acclaim for her well-schooled spinto voice, deemed by Arturo Toscanini ‘the most beautiful in the world’. Equal ease in both the German and Italian repertories made her invaluable to many opera houses during this time and her scrupulous musicianship and unfailingly lovely sound brought worshipful audiences to her feet. Despite a certain lack of dramatic impetus, her performances during the prime years ranked with the best. In her years at Dresden (up to 1922), Rethberg undertook a wide range of lyric-dramatic roles covering a spectrum from Susanna in LE NOZZE DI FIGARO, the Empress in Richard Strauss' DIE FRAU OHNE SCHATTEN, and Sophie in DER ROSENKAVALIER to Tosca. In 1922, she found herself at the Salzburg Festival where she continued her dizzying embrace of roles with widely differing demands. For that first season, she performed both the Countess in FIGARO and the much higher-lying Konstanze in Mozart's DIE ENTFÜHRUNG AUS DEM SERAIL. 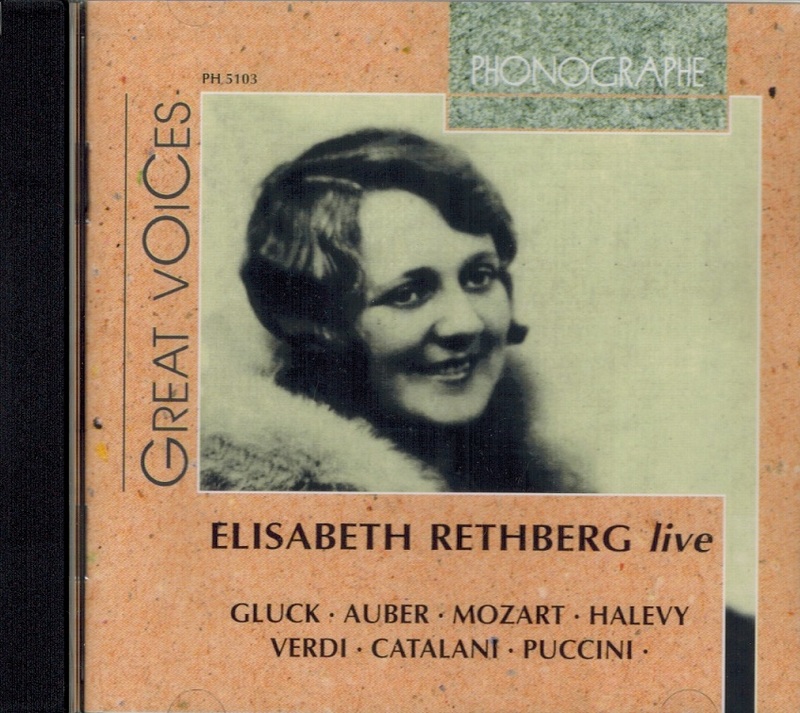 In November 1922, Rethberg made her début at the Metropolitan Opera in New York where her Aïda brought glowing reviews and established her as a Met stalwart for 20 consecutive seasons. In New York, she concentrated on the spinto repertory, the area most congenial to her instrument. Other Italian roles there included Cio-Cio-San, Maddalena in ANDREA CHÉNIER, Amelia in Verdi's SIMON BOCCANEGRA, Desdemona, Leonora in IL TROVATORE and even Rautendelein in Respighi's LA CAMPANA SOMMERSA (The Sunken Bell), a rarity led in 1928 by conductor Tullio Serafin. Her German roles included Agathe in Weber's DER FREISCHÜTZ, Sieglinde, Elsa, Elisabeth, Eva and an ill-advised SIEGFRIED Brünnhilde late in her career. In San Francisco, Rethberg appeared regularly from 1928 until 1940, her roles there including such relatively non-repertory operas as THE BARTERED BRIDE (Marenka) and Halévy's LA JUIVE (Rachel). Rethberg was an occasional visitor to Chicago as well, offering appearances in such roles as Cio-Cio-San, Aïda, Elsa, the TROVATORE Leonora, and Amelia in BALLO IN MASCHERA from 1934 to 1941. 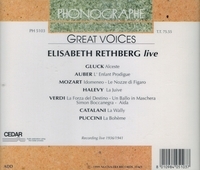 “I do not hesitate to compare her voice to a finely played Stradivarius.